Elated/Mole abuelita Enchiladas are among the creative vegetarian dishes at Gratitude newport Beach. When dining out, those following a vegetarian or vegan diet have long found themselves relegated to ordering off the salad and side dish menus as most restaurants have centered their entrees around meat. However, that approach has been changing in recent years and plant-based plates are now gaining top billing at local eateries as chefs increasingly cater to the demands of health-focused guests. And, as recipes become more innovative, many of these veggie dishes are not only good for you, but taste good enough to tempt even die-hard carnivores to give them a try. 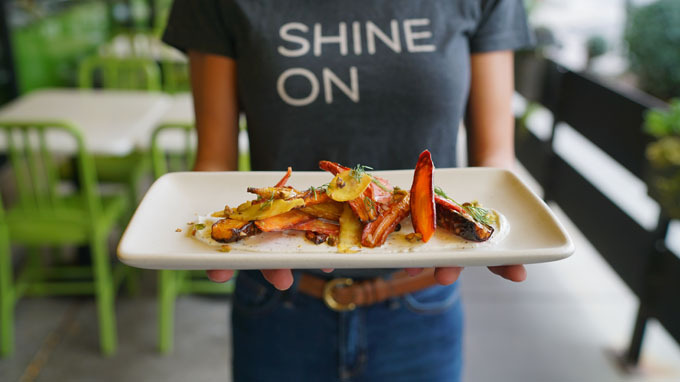 True Food Kitchen’s new roasted heirloom carrots incorporate za’atar, a Middle Eastern spice blend, as well as sesame seeds, chopped pistachios, Greek yogurt and dill. A plant-based diet is exactly what its name suggests—one that encourages the consumption of nutrient-dense plant foods like vegetables (cooked and raw), legumes, nuts and fruit. Many adhering to this healthy regime also aim to eliminate all processed foods, replacing canned or frozen meals with naturally derived items. While some devout followers give up animal protein, seafood and dairy altogether, others retain small amounts of it in their diet. A vegetarian diet doesn’t just sound like a healthy alternative, studies have shown that adhering to a meatless meal plan can help alleviate conditions from hypertension (high blood pressure) to diabetes. 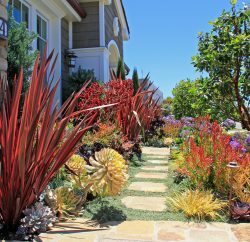 “Nutritionally speaking, the plant-based diet is perfect for individuals struggling with weight gain … [and] chronic diseases,” says April Murray, a registered dietitian, Newport Beach resident and founder of Orange County Nutrition Coaching in Costa Mesa. “… [And] a plant-based diet is naturally anti-inflammatory which is really helpful in terms of preventing disease including the big ones like heart disease, liver disease, cancer, Type II diabetes, et cetera,” Murray says. Though switching to a vegetarian diet sounds like a perfect solution, adhering to its strict rules can be difficult. Finding approved options on menus or sharing appetizers with friends during a night out—all while making sure your body is receiving the protein and nutrients it needs—is no small challenge. Murray recommends this diet to clients who are willing to make drastic lifestyle changes, including reading all food labels and preparing most of their meals at home. Another hurdle, Murray says, is that most vegan and vegetarians tend to consume too many carbohydrates in attempts to feel full. She advises her clients to try a variety of plant-based proteins such as legumes, nuts, whole grains and soy instead of pastas, potatoes, bread and rice—which can instead make dieters gain weight. 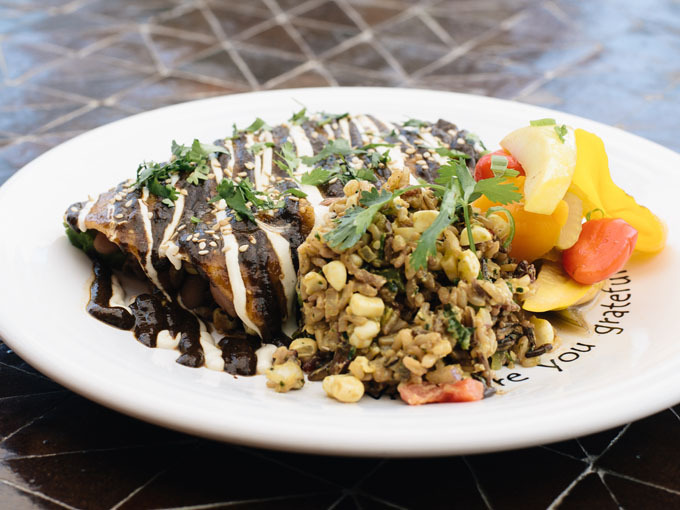 For plant-based dieters or those who may want healthier options when dining out—and a break from cooking—the Newport Beach restaurant scene offers plenty of eateries with vegan and vegetarian selections that stretch far beyond your typical veggie burger. When thinking about plant-based eating, Gratitude Newport Beach (part of the regional Café Gratitude chain) is a go-to spot. Dedicated to gourmet, plant-focused cuisine, Gratitude aims to support not only health but also the community—by embracing local ingredients. Among Gratitude’s creative dishes—each with a positive affirmation as part of the name—include Liberated/Raw Pad Thai Kelp Noodles and Elated/Mole Abuelita Enchiladas; the latter is made from blackened tempeh and black beans, then topped with roasted tomatillo sauce and cashew queso fresco. For those seeking an Italian-style dish, try the Bountiful/Blackened Tempeh Bolognese, which combines gluten-free quinoa pasta shells with mozzarella and Parmesan cheese made from cashews and brazil nuts, respectively, broccolini and spinach. The menu even offers a dish with flavors from the East: the Humble/Indian Curry Bowl mixes red lentil dal, quinoa or brown rice, spinach, roasted yams and coconut-mint chutney. Coconut also has starred in salads and other dishes—the flakes are flavored to taste like bacon with surprisingly delicious results. Gratitude Newport Beach, a light and airy space on Westcliff Drive, offers a wide range of plant-based dishes. 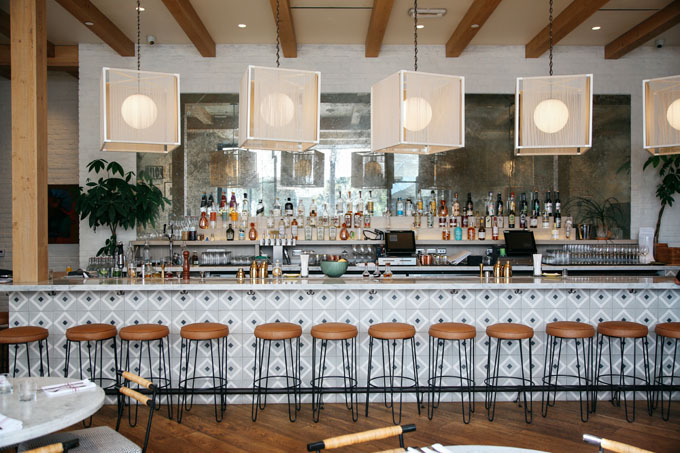 Another local gem is, of course, True Food Kitchen at Fashion Island. 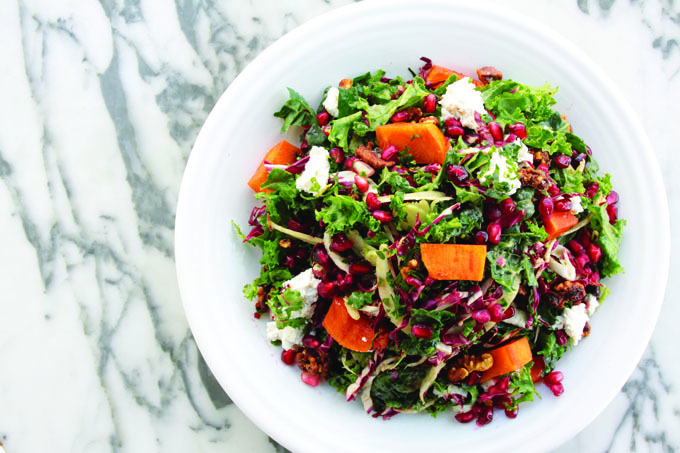 This restaurant’s health-driven, seasonally inspired dishes are rich in nutrients and flavor, serving plant-based items at the peak of their freshness. This season, Taylor Domet, director of culinary standards for True Food Kitchen, is raving about the addition of the roasted heirloom carrots dish, comprising za’atar (a Middle Eastern spice blend), sesame seeds, pistachio nuts, Greek yogurt and dill, a vegetarian and gluten-free option on the winter menu at True Food Kitchen. 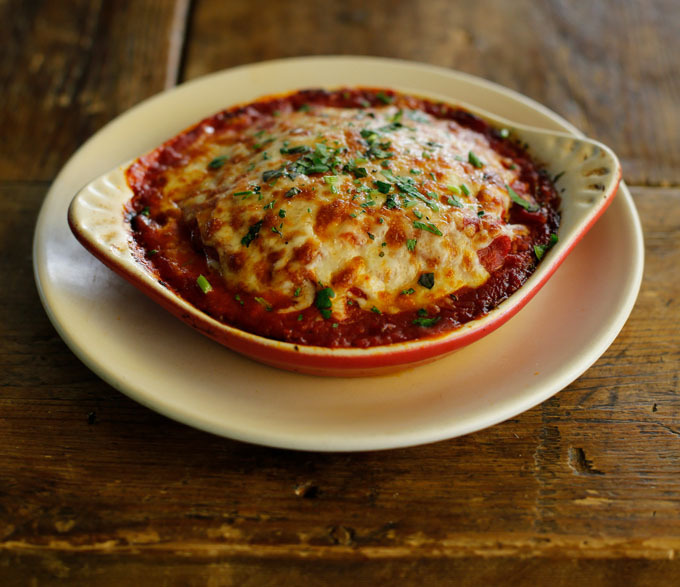 Another favorite at True Food Kitchen is the spaghetti squash casserole, made with organic tomato, zucchini, caramelized onion and fresh mozzarella. Vibe Organic Kitchen & Juice is another great choice for plant-based dieters. This small but mighty eatery offers inspired items that are a must-try. “Everyone is eating avocado toast these days, but what makes the rendition at Vibe unique is the ability to skip the bread altogether and have it served on grilled, slightly crispy sweet potato slices,” says owner Josh Leibowitz. A menu standout is the Fiesta Bowl, which swaps out traditional carnitas for spicy jackfruit. “Once the jackfruit is shredded and cooked in a spicy red chili salsa, you’ll struggle [to] tell … the difference,” Leibowitz says. The dish can be served over quinoa, rice, cauliflower rice or greens with guacamole, pico de gallo, black beans and cashew-lime crema to replace traditional sour cream. 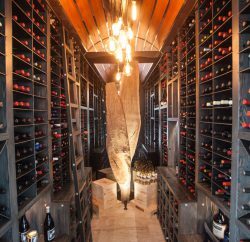 The availability of so many veggie-focused, health-conscious selections right in Newport Beach makes it that much easier to adopt a plant-based diet and sustain such a lifestyle successfully.